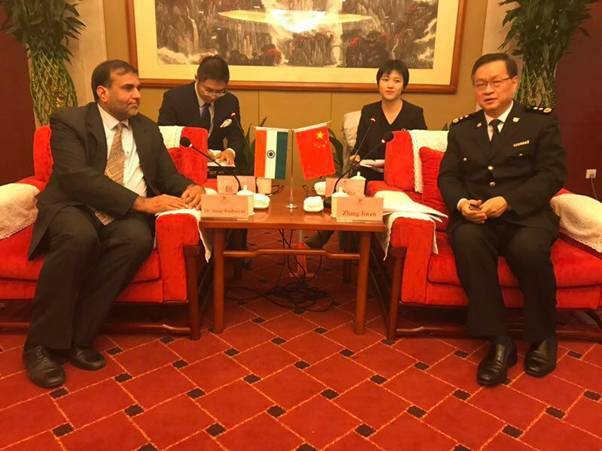 Commerce Secretary, Dr.Anup Wadhawan, was on a two-day official visit to Beijing last week. During the visit from 21st to 22nd January 2019, he had bilateral meeting with Mr. Zhang Jiwen, Vice Minister of General Administration of China Customs (GACC), for examining market access and quarantine issues for India’s agriculture and allied products. During the meeting with Mr. Zhang Jiwen, Commerce Secretary appreciated GACC for expeditiously addressing long pending agricultural market access issues for Indian products, following the understandings reached on these matters at the Informal Summit in Wuhan last year between President, Xi Jinping and Prime Minister, Narendra Modi. Since that Summit, the protocol on exports of non-basmati rice was signed in June 2018 on the sidelines of the SCO Summit. GACC has also approved 6 Indian mills for export of rapeseed meal to China. The protocol on exports of fish meal and fish oil was signed during the visit of China’s Vice Minister of GACC to New Delhi in November 2018. The GACC has also deputed experts to inspect Indian soyabean meal establishments and pomegranate orchards and pack houses in December 2018. The SPS Protocols for these products are at an advanced stage of negotiation. During the visit of the Commerce Secretary, India and China also signed the protocol for exports of Indian tobacco leaves to China. Quality tobacco on par with international standards is available in India at competitive prices and there is good potential for export of Indian tobacco to China. The revival of the phytosanitory protocol with China will pave the way for revival of Indian tobacco exports to China and prove economically beneficial to Indian farmers. The recent period has thus seen significant progress in market access for a number of agricultural and allied products from India. The Commerce Secretary requested the GACC to expedite market access for other products like okra, soyabean, bovine meat and dairy products. Commerce Secretary also held a bilateral meeting with Mr. Wang Shouwen, Vice Minister of China’s Ministry of Commerce, to discuss the progress made under RCEP negotiations and efforts to strengthen bilateral trade.